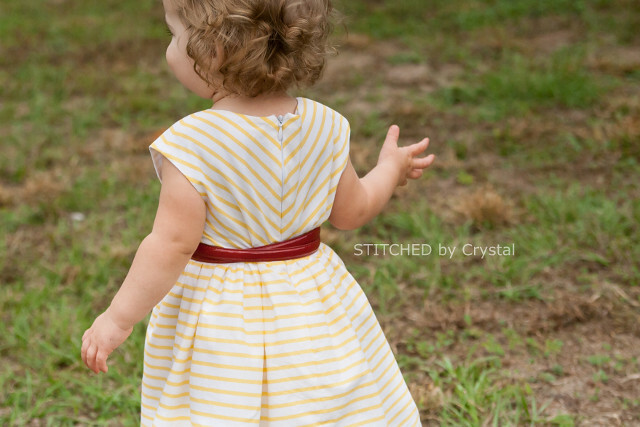 After I posted about the Caroline Party Dress I made last month, I had a few people email me asking about how to do the stripes on the bodice. I decided to put a quick tutorial together to share my technique for cutting bodice stripes on the bias. I love sewing with stripes, you can play with the orientation of the stripes to give your garment a totally different look. As soon as I saw The Caroline Party Dress by Mouse House Creations, I knew I wanted bias cut stripes on the bodice to accent the faux cap sleeves. 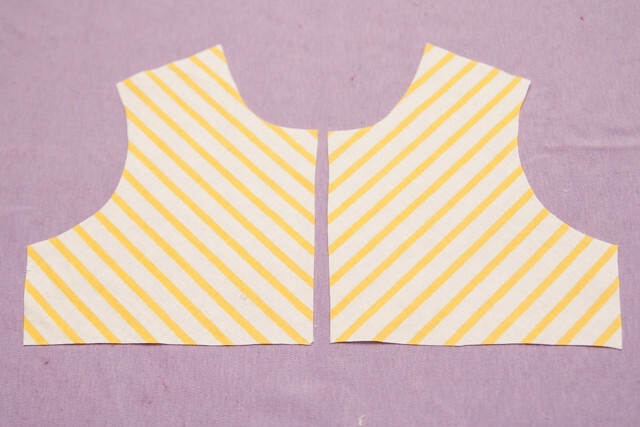 This technique for cutting your bodice will give you perfectly aligned bias cut stripes on the front and back of your dress as well as lining up the stripes over the shoulders too. 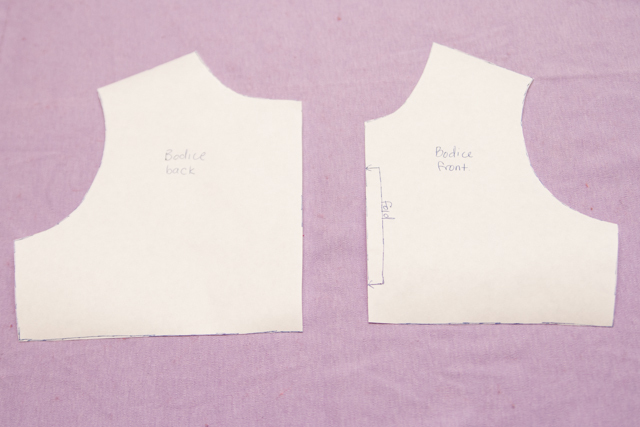 This technique can be used on any basic girls bodice pattern. 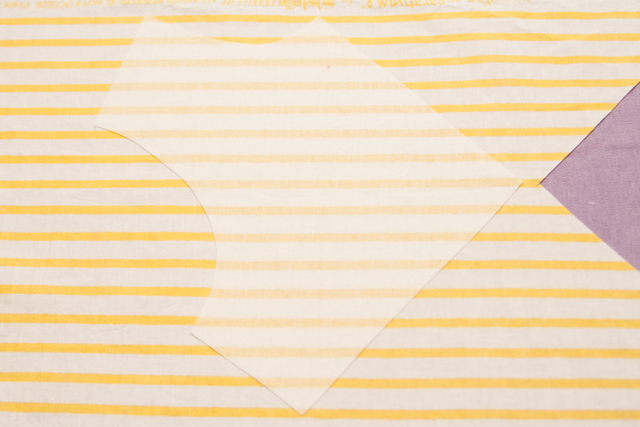 Most bodice fronts are cut on the fold. 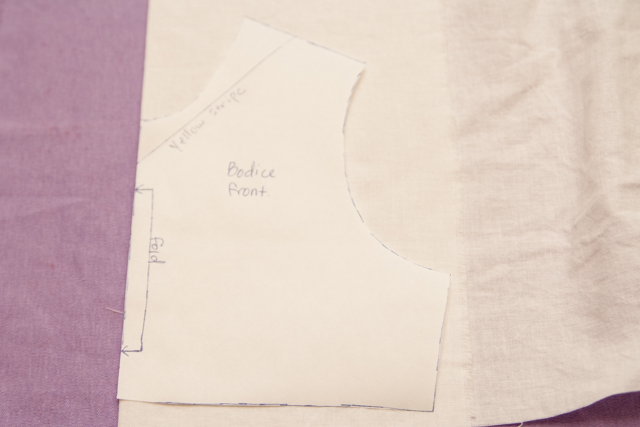 Because the front will have a seam in it, you will need to add a seam allowance to your pattern. I did this by cutting a strip of paper 1/2" wide and adding it to my pattern piece. Draw a line on your pattern at a 45 degree angle from the straight side of the pattern. You will want the line to intersect the shoulder. I wrote "yellow stripe" below my line so that I know to line my pattern up with a yellow stripe below that line. That is not so important when you only have one color stripe but can be helpful if you are working with a fabric that has several different color stripes. 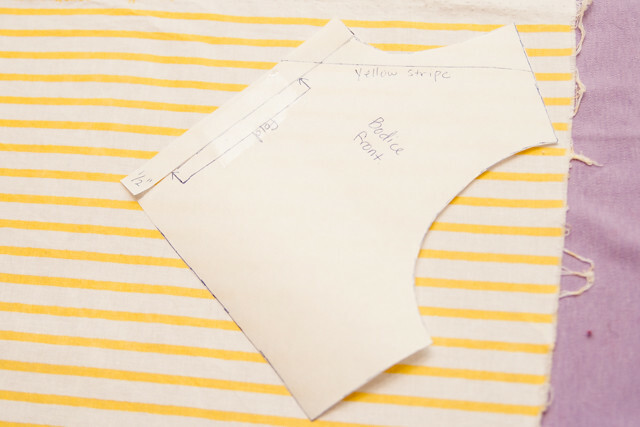 Lay your pattern piece on top of your fabric with the line you drew lined up with the stripes. Cut one front bodice piece. 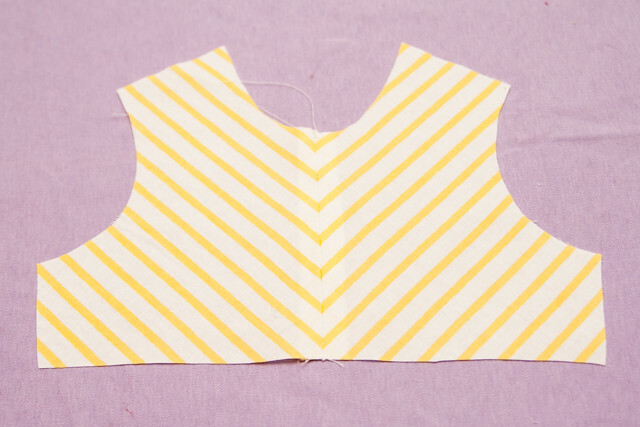 Next take the bodice piece you just cut and lay it on top of the fabric, line up all the stripes and use it as a template to cut your second front bodice piece. Now you have 2 mirror image front bodice pieces cut on the bias! 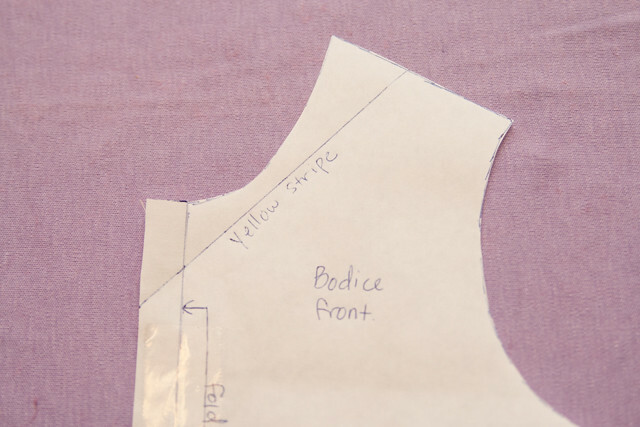 Place the 2 bodice fronts right sides together and sew along the center with a 1/2" seam allowance to create your bodice front. Press the seam open. Line up the shoulders of your front and back pattern pieces. 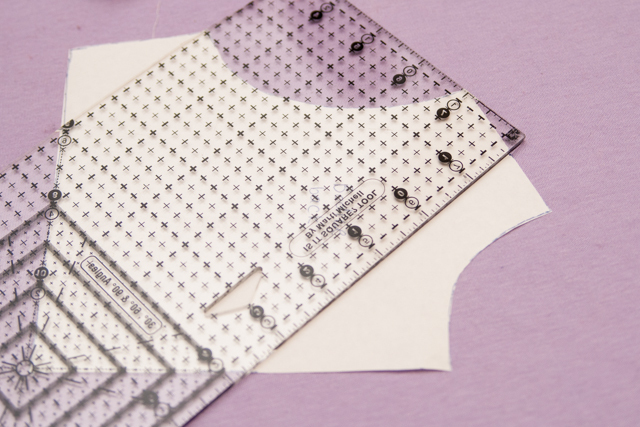 Make a small mark on the back pattern piece where the bias line from the front pattern piece. Draw a line at 45 degrees from the center back intersecting that point at the shoulder. Label it with the same color stripe you used for the front. 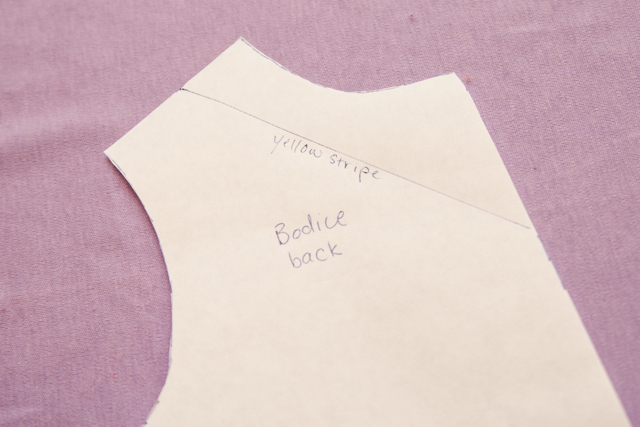 Cut your back bodice pieces just like you did the front pieces. 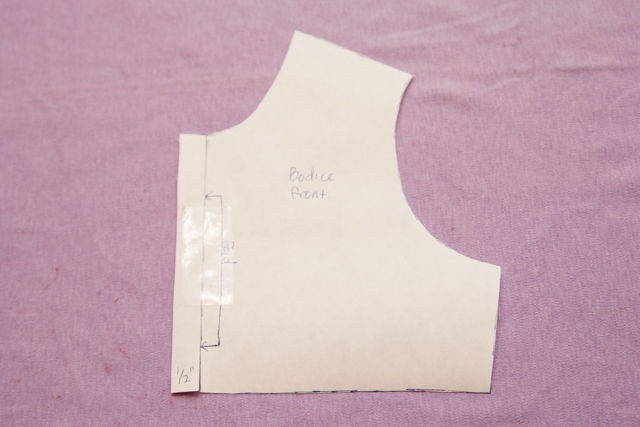 You now have your bodice pieces and are ready to sew your dress! 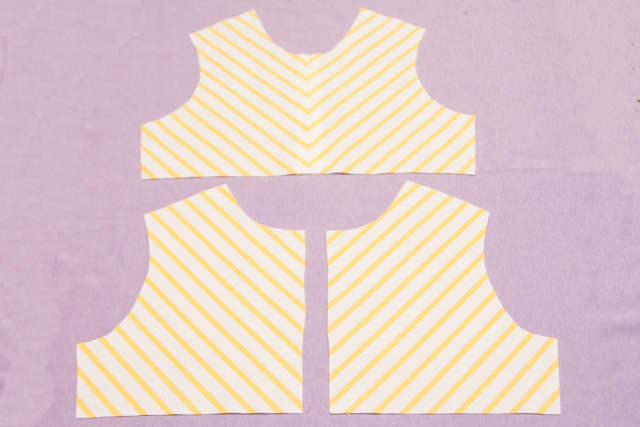 Cut all your lining and skirt pieces and sew your dress as directed in the pattern. 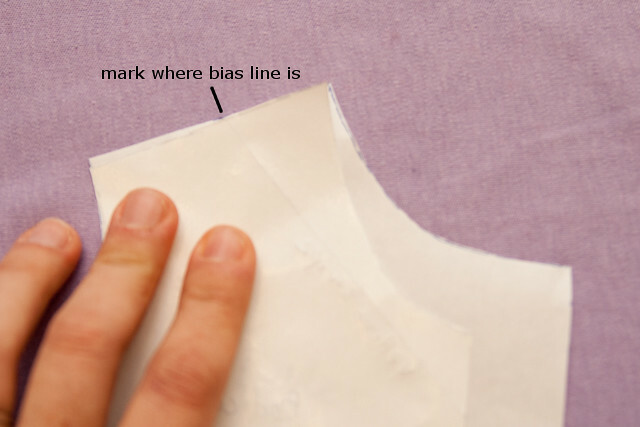 Make sure you remove the extra seam allowance from the pattern front or fold it under when you cut your lining pieces. You make it so simple, this is wonderful! I would love to link to your tute in an upcoming Daily DIY if you didn't mind.